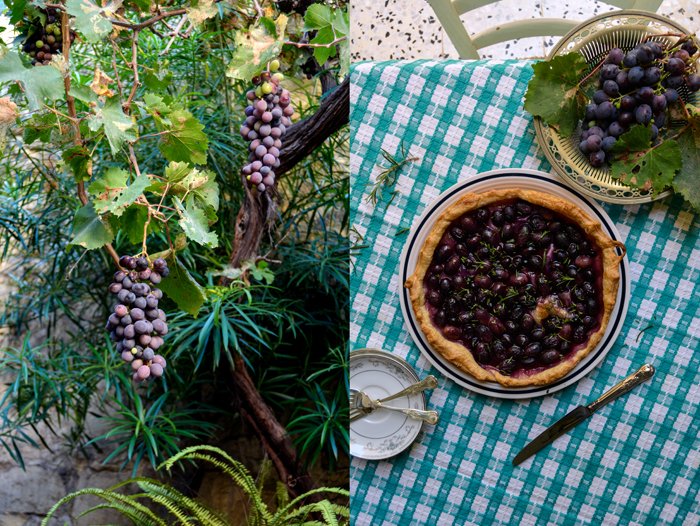 This tart combines two of my favourite Mediterranean flavours – grapes and rosemary – and the result is nothing less than heavenly. The fact that the aromatic filling lies on top of buttery crisp puff pastry only exaggerates the temptation. After failing miserably at making my own puff pastry on a few occasions, I only use this sweet delicacy when I’m in Malta, when I can buy it frozen in exceptionally good quality. If I ever manage to come up with a recipe that’s as good as the product that I can buy here from the supermarket, I’ll be a very happy baker. 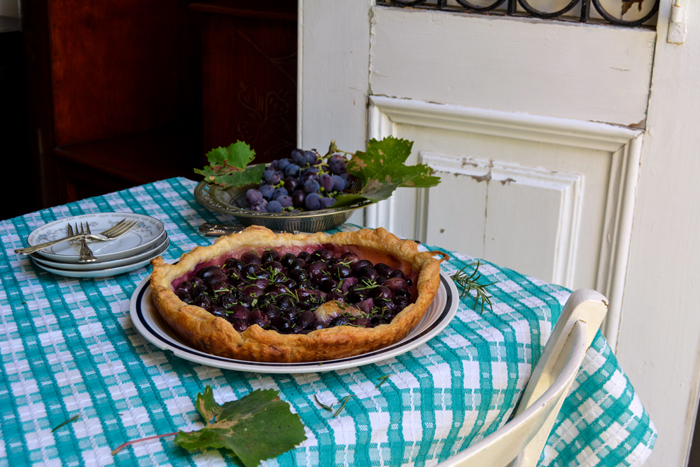 You could also use a shortcrust base for this summery tart but I like the elegant look and flaky texture of puff pastry in combination with the syrupy, juicy grapes. The chopped fresh rosemary sprinkled on top of the warm cake as soon as it comes out of the oven adds a woody aroma and gives it an unusual touch – try it, it’s fantastic. 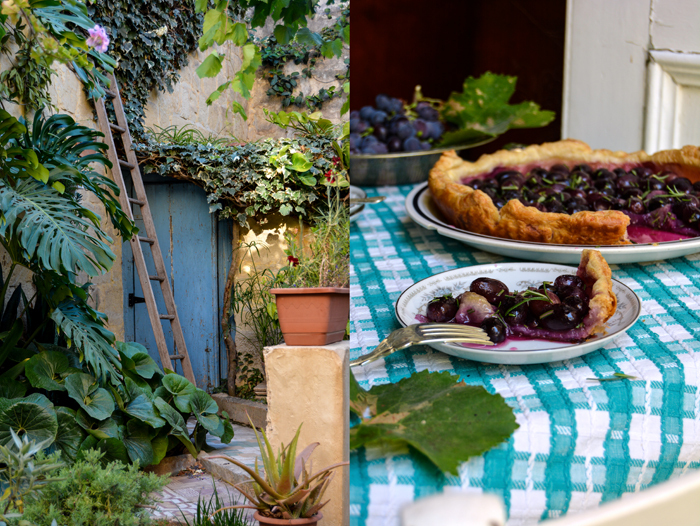 I used it for a focaccia recipe last year and got hooked on this tasty duo. 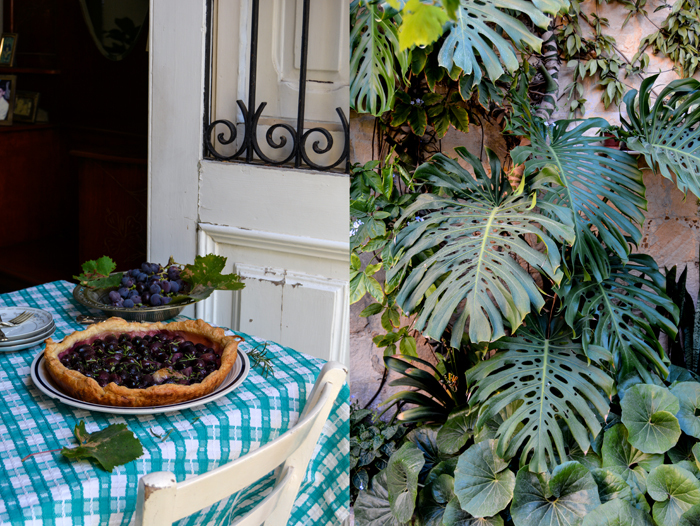 I’ve already baked this tart twice since we arrived in Malta and it immediately gained huge popularity within our family – everybody loves it, kids and grandmother included! 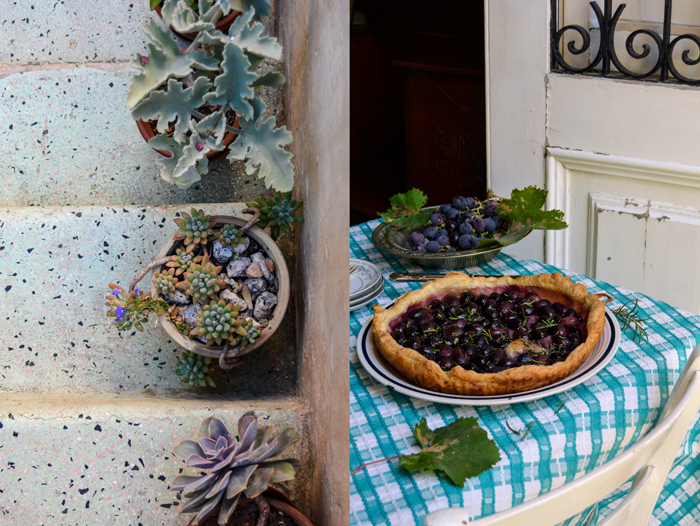 Makes 1 (28cm / 11″) tart, serves 4-6. Preheat the oven to 200°C / 400°F and butter a 28cm / 11″ tart pan. Line the tart pan with the puff pastry, pushing the pastry into the pan, and put in the freezer for 5 minutes. 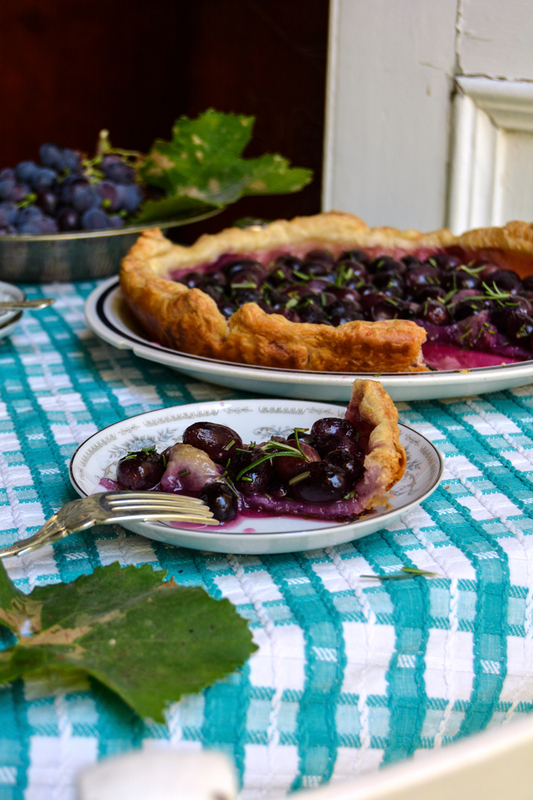 In a large bowl, using a large spoon, mix the grapes, sugar, and lemon juice and spread on top of the chilled pastry. Bake for about 40-45 minutes or until the pastry is golden brown and crisp at the edges. 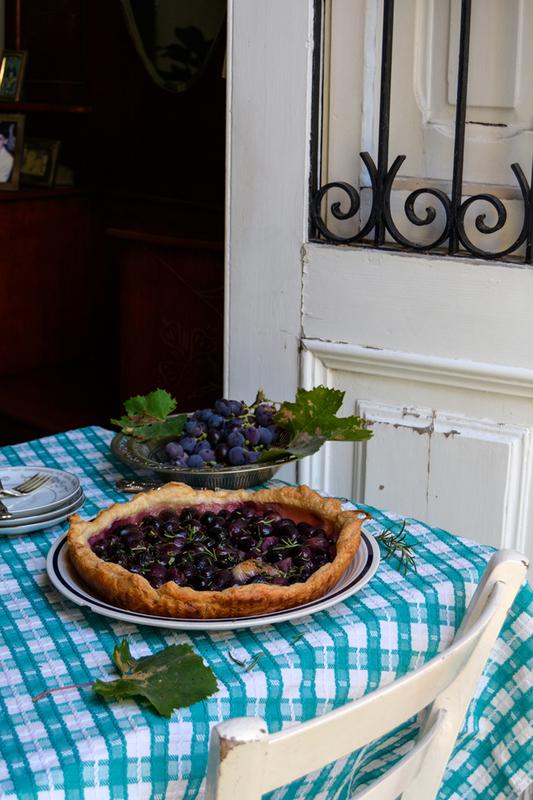 The grapes will be juicy, so the bottom of the tart won’t be crisp. 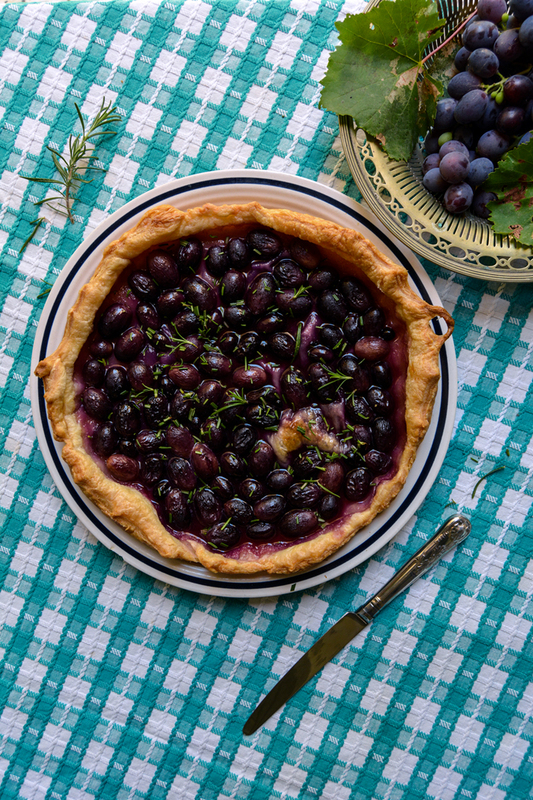 Sprinkle the tart with the rosemary and let it sit for about 10 minutes before serving. Do you think this filling would work in an almond/hazelnut pie crust ?